One question I've been asked is how I mark my sewing lines on fabric. My short answer is, "Erm, I don't." The long answer is, "I mark points, and then sew straight or curved lines between those points, using the presser foot width to keep the seam allowances uniform." I am becoming more aware that some of my sewing methods differ from those used by other people. I don't know how much is a consequence of culture, or Homec, or having started sewing lessons one generation ago, or living in my mother's house, but I can see how these methods might seem odd to other folks. 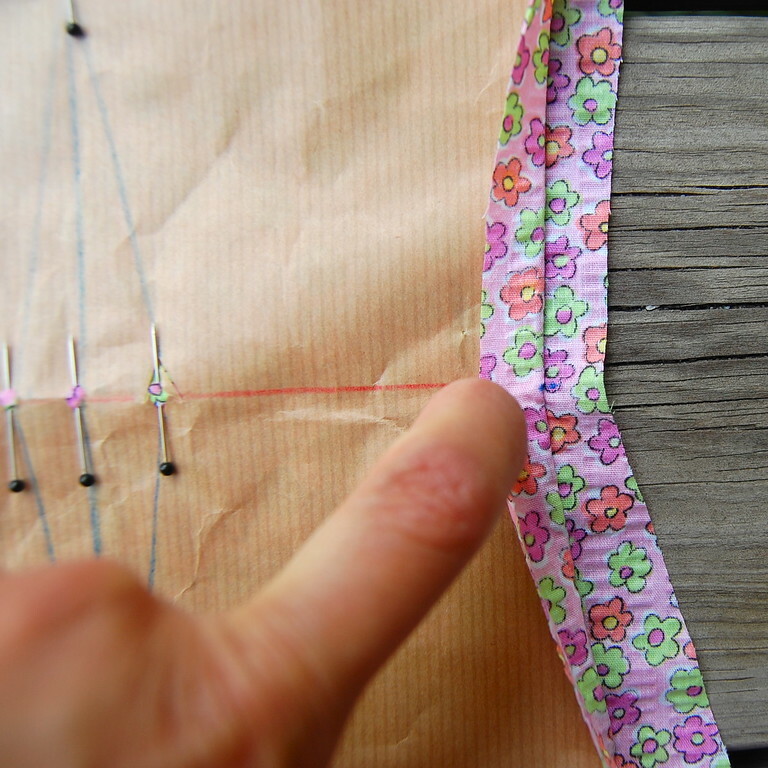 Old method of unpicking a seam: Unpick a few stitches at the start of a seam to release about 1.5" of thread. Then unpick a stitch about six inches down to create an end to that thread, and pull that 6" of thread out. Repeat every 6 inches or so till the end of the seam. Works in many but not all cases, like when the stitches are very, very fine. New method of unpicking a seam (learnt from my friend Jen about two? three? years ago, immediately forgot and remembered only last month): Cut every three stitches along the seam. Then pull thread out from the underside. Entire seam will unravel, but must get lint roller to pick up the cut threads on the top side, or else scrape madly with fingernails. Either way, hurrah! 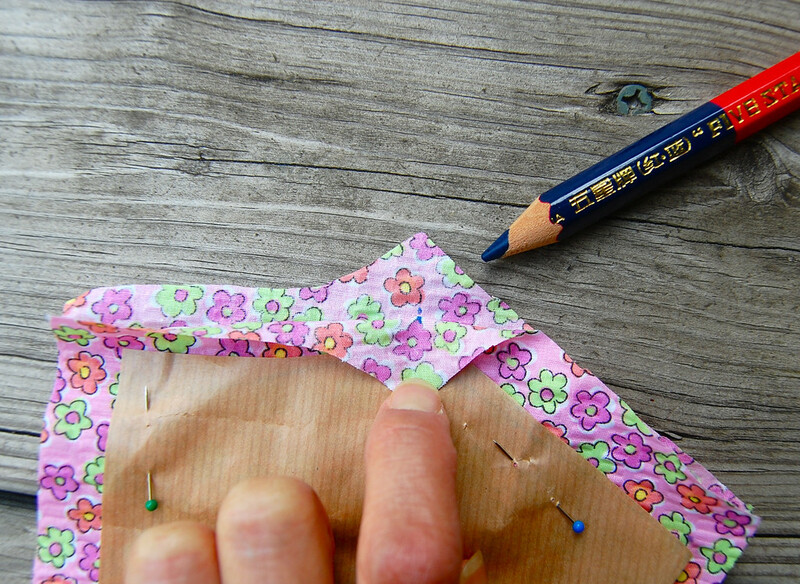 In grateful response for all these fun new lessons, I thought I'd share one of my Old Sewing Methods: How I Mark Sewing Points on Fabric. Maybe everyone does it this way, in which case I will feel very daft doing a tutorial on it. But maybe it is another newish method of doing an old thing for some of you. 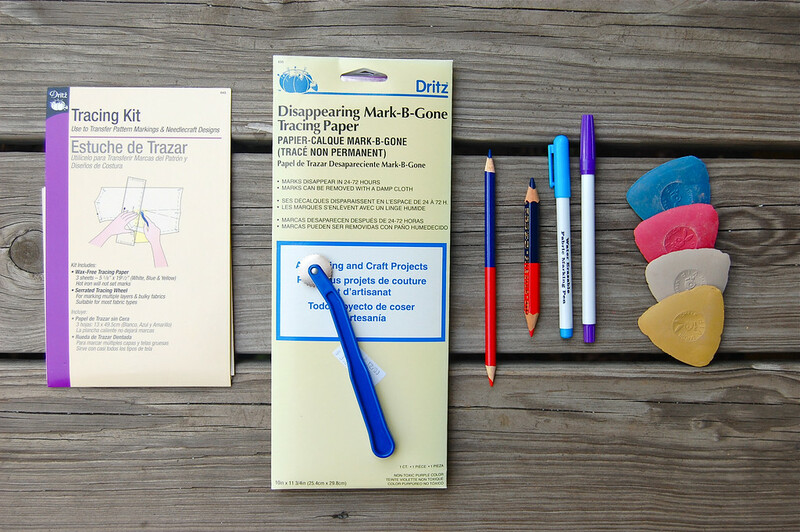 Left to right: Carbonized tracing paper (two kinds) with tracing wheel, color pencils, eraseable fabric markers (some are air-eraseable and some are water-eraseable), tailor's chalk. I use a lot of my drafting pencils (they're just two-ended color pencils) and erasable fabric markers. I never use my carbon paper unless I am transferring embroidery designs. 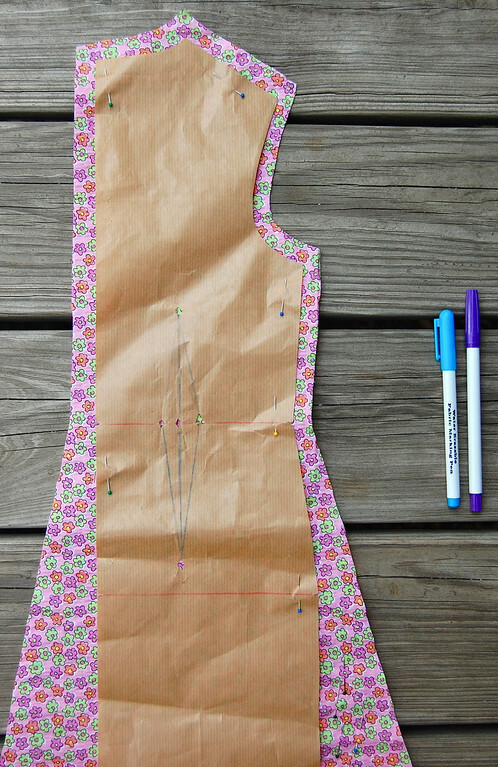 Cut notches or holes at the important points on your pattern that are not at corners- waist, hip, darts, etc. These are especially useful for tracing this pattern onto another sheet of paper, if you want to save the original - you just mark through the holes. Also my patterns have no seam allowances, which also makes it easier to trace around them onto paper. But I digress. 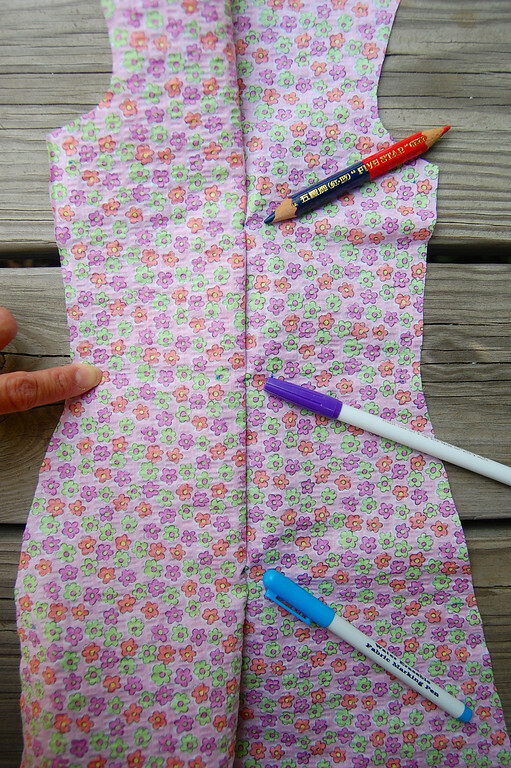 Fold fabric so that the right sides are OUTSIDE (wrong sides facing in). Counter-intuitive maybe, but bear with me. Lay out and pin paper pattern to the fabric. Iron any folds (usually center front or center back if no zippers or button plackets). Here's a closer-up picture of the waist notch area - where the purple marker is. In the above photos, ignore the ridiculous seam allowances in the lower half of the pattern. 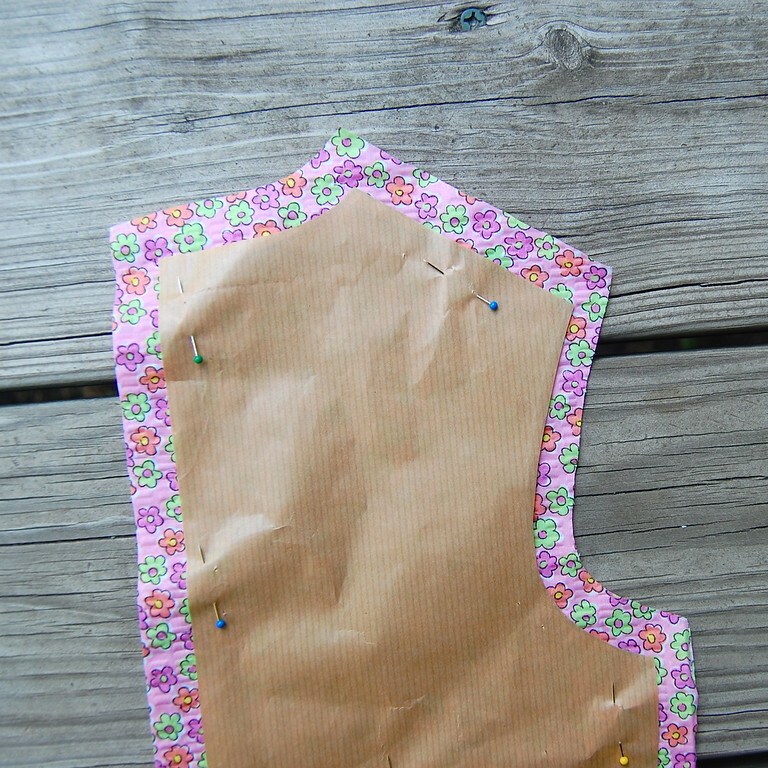 The paper pattern is Jenna's sloper (will yield a sheath dress - and which child enjoys wearing a sheath dress? 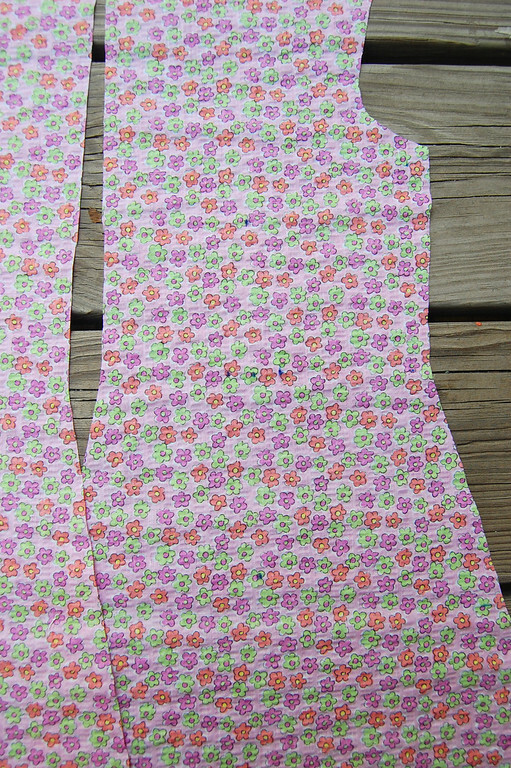 ); the fabric thing is Jenna's muslin mock-up, in spite of it being pink and floral seersuckerish and not muslin at all. Might as well sew it into a wearable garment, I thought. Jenna picked out the fabric herself at the store, incidentally. Remember how she used to love blue? Sniff. No longer. Pin through the holes/notches you cut in Step 1, so that the pins (in the photo, these are the black pins) go through both layers. 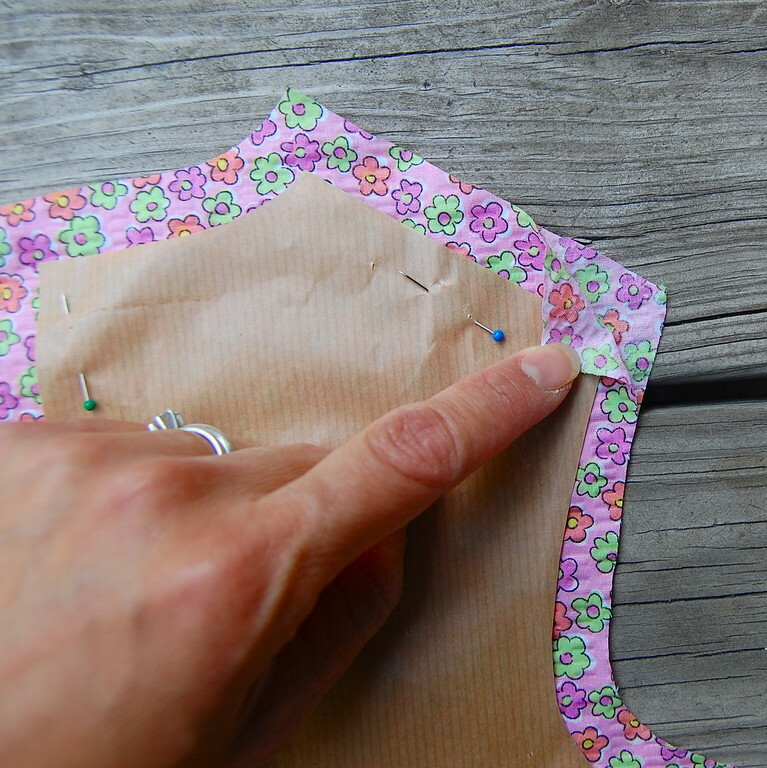 The holes/notches you cut will allow you to pin through the fabric without having to actually poke through the paper. At the corners (shoulder point, neck point, bottom of armscye etc, fold back the top layer of fabric over the corner of the paper pattern and mark on both layers (wrong side). I realize that this method works when your patterns have no seam allowances; if yours do, use the pin-method in Step 6 or 7 or just trim them off the pattern itself. 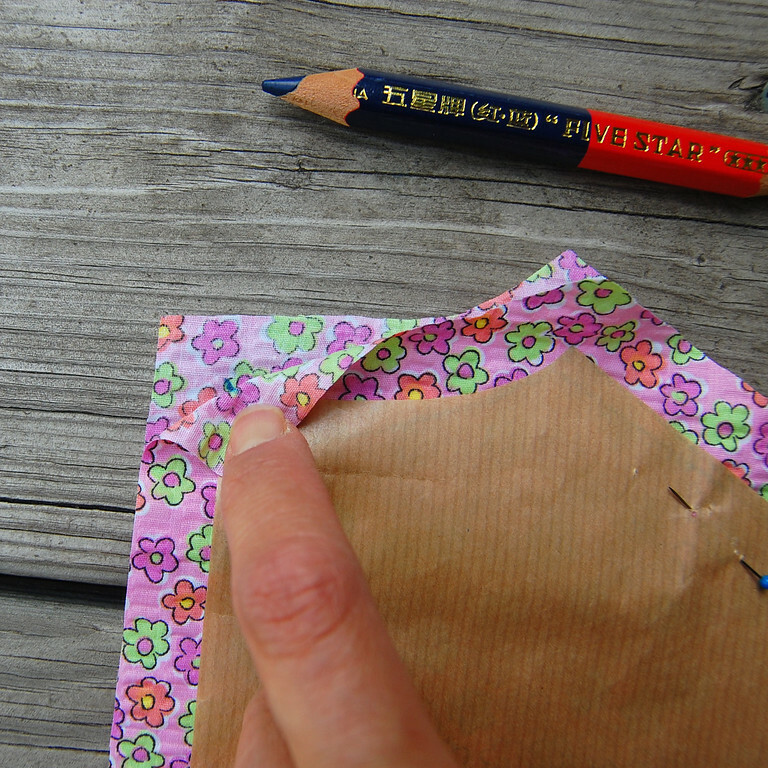 The heavier brown paper I use gives sturdier corners over which it is easy to fold the fabric. At the sides (waist point, hip point), fold back the top layer of fabric until you see the pin (or the stuck-together fabric bit where the pin has gone through the layers), and mark both layers (wrong side). You will feel the pin under your pencil tip/marker nib even if you can't see it. At internal points (e.g. 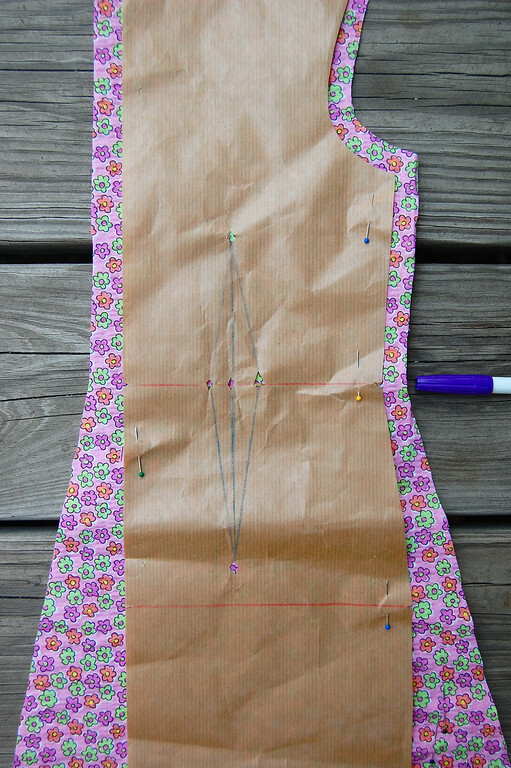 dart points), remove all the pins along the outline of the pattern so that you can fold back the top layer of fabric to expose the pinned point you want to mark (in this case, the side dart point. Mark point on both layers (wrong side). Remove those pins, continue folding back the top layer to expose the next pinned point and mark it, until all the points are marked. Remove all the pins. All the important sewing points are marked on the wrong side of your garment pieces. The only other thing I do after this is fold the darts along their midlines and iron/press those midlines. 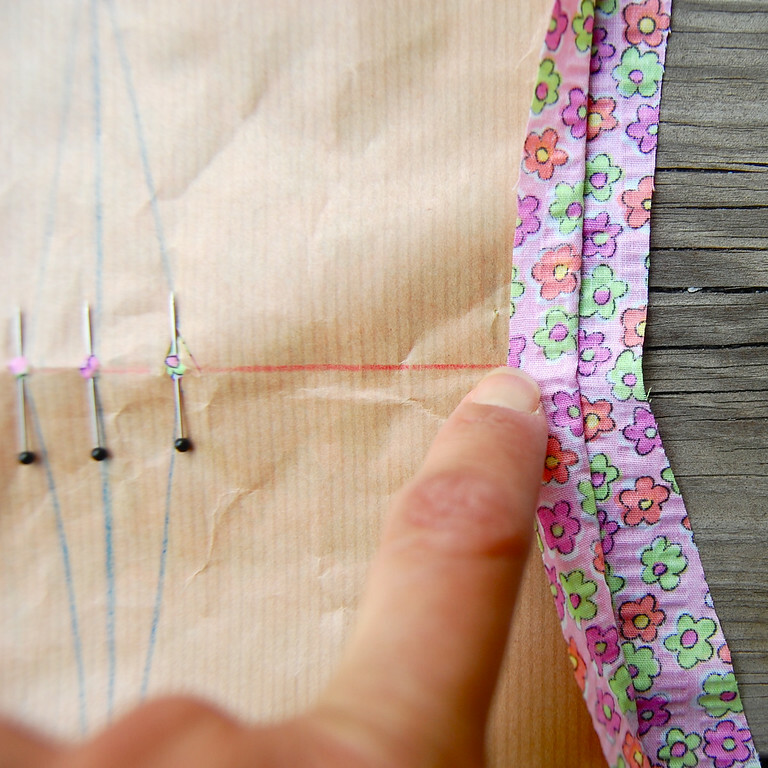 The positions of these points also indicates the seam allowance for the seams that start from those points because of their distance from the edges of the fabric. I sew from point to point, using the presser foot to keep the seam allowance constant. 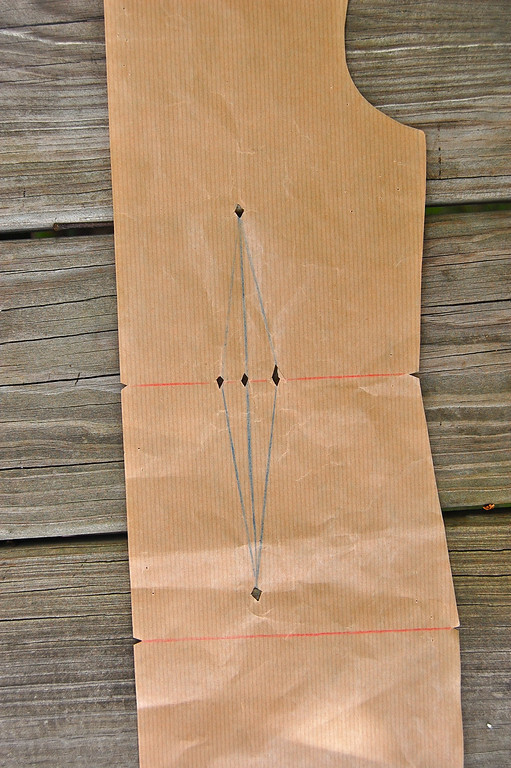 If I want to be especially precise, I might also draw the dart lines with a ruler and chalk/eraseable marker on one side of the dart, so that I will sew a true straight line between dart points. I am guessing, but do most people use carbon paper and a tracing wheel to transfer entire sewing lines onto each piece of fabric? It seems like a lot of work, although nowhere as labor-intensive as tailor's tacking, which we were taught to do in Homec. Gotta love Homec, but who now has that luxury of time? Until recently, I never thought to not use seam allowances on patterns. (grin) And my pattern markings, well they are just little snips into the seam allowances for the most part, with an occasional straight pin of matching color stuck where darts and such were indicated. Heck, I never even knew you could trace patterns onto other paper so you could use ALL the sizes. I know, so obvious, but I have never seen anyone else sew but an instructor I had when I was 7. I, being vintage myself, use my old vintage Tack-It pattern marker (you can see one for sale on eBay here) if I have a lot of marking to do. Otherwise I use a colored marking pencil or an eraseable marker. Lindsey, you made me smile!. And you are way ahead of me in the commercial patterns game, since you've at least used them! Buttonholes at ? Whoo! Isn't it strange how we can't make our kids do what we want? Still, you might be surprised how, years later when she becomes a mom herself and/or discovers blogs, she might suddenly want to sew, knit, crochet, whatever! They like to keep us guessing! Ha! I guess the result of the figure-it-out-myself mentality is that I didn't know people actually marked the stitching lines. What!? I use the foot or the plate markings as a guide and never thought there was some other way. 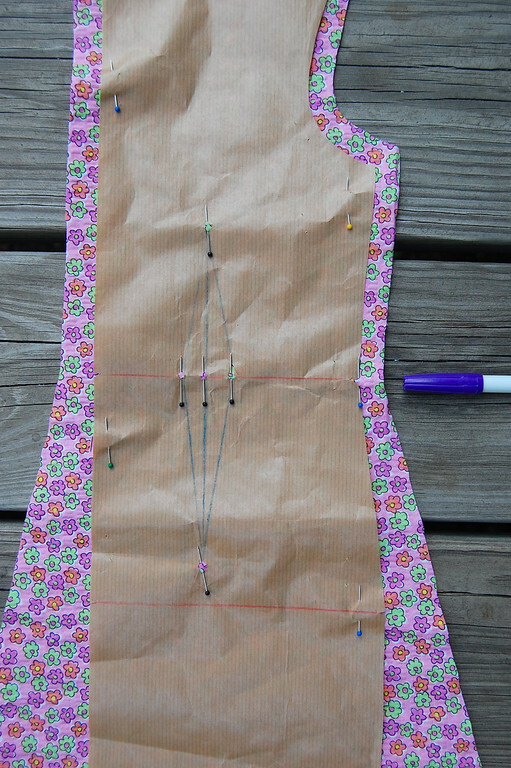 For darts legs, I snip into the seam allowance and for the points, poke a hole with a pin through the pattern and fabric, and mark the wrong side with an x (using a ballpoint pen). Then stitch from point to point. Well, it doesn't baste. It doesn't actually "tack", either. 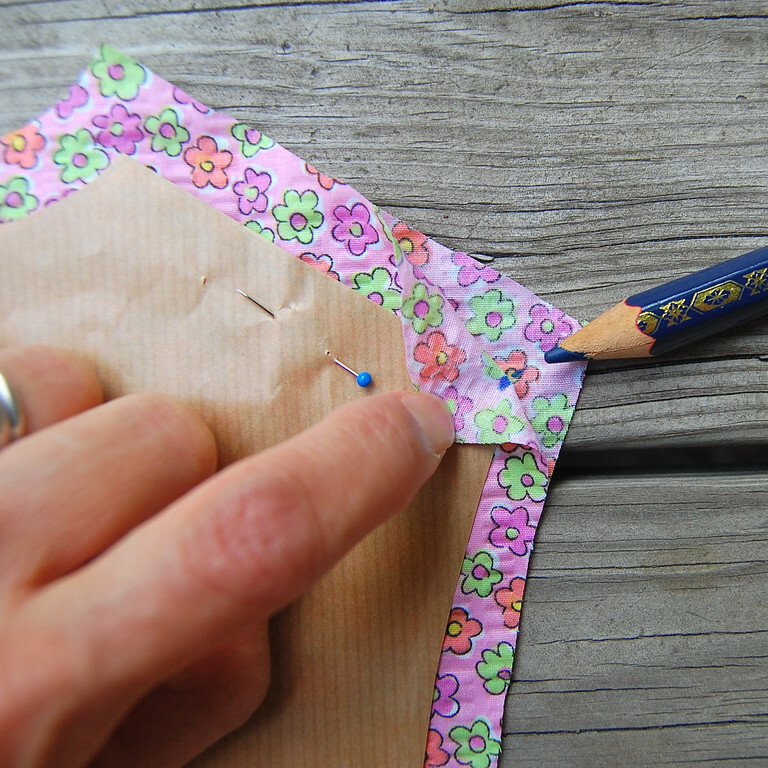 It simply makes a mark (a tiny circle) on your fabric using marking paper like you would use with the tracing wheel. Now that I am living 12 hours away from her, I go through all kinds of contortions to mark my patterns (but I never have drawn in whole seam lines!) LiEr, I think your tiny-holes-with-pins is a genius idea! Please, please it is learned "not" learnt. Thank you. Instead of all the pinning and lifting the pattern, why not just put it on the wrong side to begin with and mark through the holes? But I digress. Back to marking techniques. I did sew all my own clothes in high school (and hated Home Ec sewing as I was so far beyond what was being taught). My Great Aunt taught me to sew on a Singer Hand Crank, sitting on her lap. I made my first potholder when I was 3. My Great Aunt had been a professional dressmaker and milliner, both in England, and Canada. 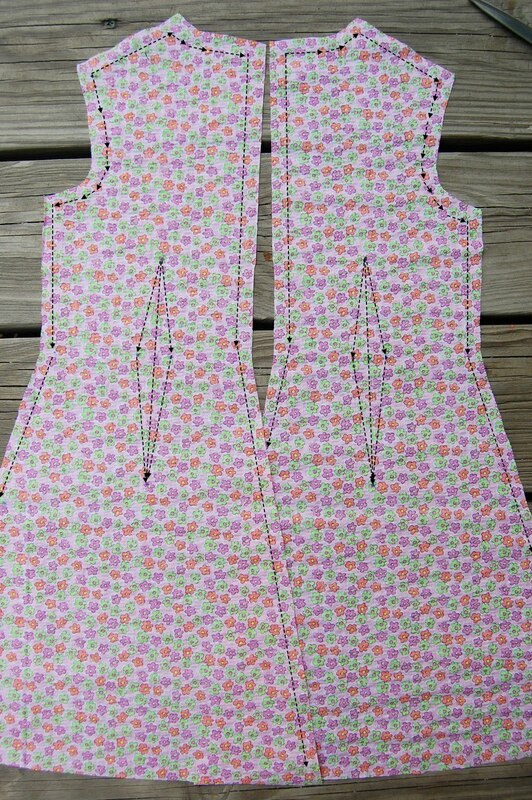 To avoid tailor tacks, I used two dressmaker's pins ( the long ones with the tiny heads). I just pushed one all the way through from each side, so when I pulled off the pattern (I used commercial patterns that I adjusted for fit), the tiny pinhead just pulled neatly through the pattern tissue. When I pulled the two pieces of fabric apart, the pins each stayed in their fabric piece, and I just ran them each through sideways, pinning the dart in the process, and then immediately sewed my darts. Even if I chose to wait to sew the darts, the pins would still stay neatly in place. As for seam allowances, I also used the marking on the machine's plate. Later, when sewing upholstery, everything was done with a half inch seam, which to this day I can maintain effortlessly, by eye. This did however make sewing from commercial patterns problematic, so my current hobby is learning to craft my own patterns, and I'm learning quilting as well. 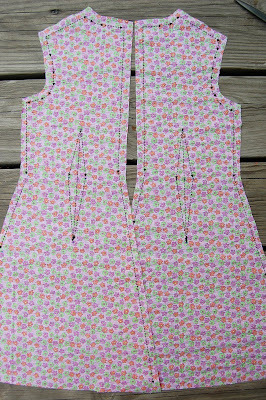 I am very much enjoying beginning to sew again, and find your tutorials among the very best I have come across online. Thank you so very much for your time and this wonderful gift of your expertise. I have taken to keeping Crayola markers in my sewing kit, because they are now so very water soluble that I can dab them out with a wet paper towel! And I get a nice clean line--better than my erasable sewing markers. I have taken to keeping a couple of Crayola markers in my sewing kit for marking fabric. They are so very watersoluble since the late 1990s (that's why they stain hands more than they used to--they get absorbed by the cells so much more rapidly--but they wash out of clothes even better than before they changed the formula). I can dab them away with a wet paper towel! I am curious. 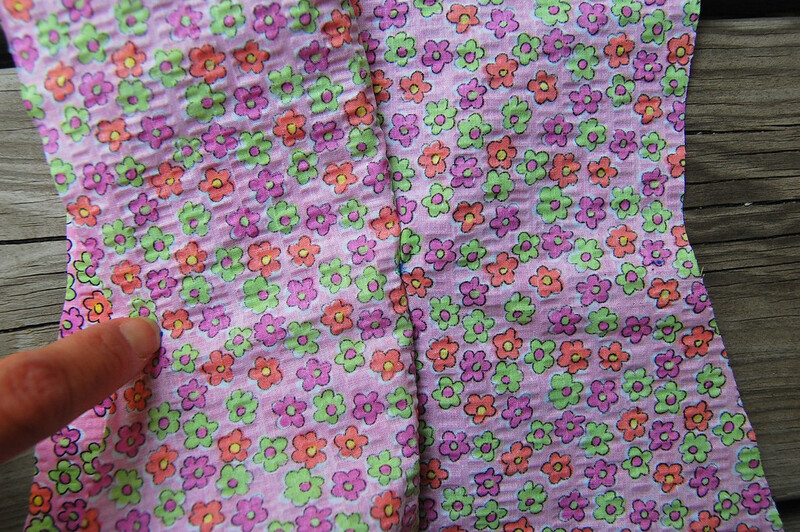 I've been sewing practically all my life with pattern with built-in seam allowance. I imagine accurately adding seam allowance while cutting the fabric to be very time consuming. You must have some kind of method other than measuring and marking, then cutting - as I am imaging it. Care to offer some insight? Josie - It is actually much quicker than it sounds! I lay my paper pattern out on the fabric and pin. Then I "border cut" around it- leaving a border of the width I want for the SA. Usually this is 1/2" at the shoulder, 1/2" at the side seams, 3/4" at the zipper seam and about 1-2" for the bottom hem. After sewing for many years, I don't have to measure these S.A. distances - I can estimate them on sight. What's more important is that I mark the sewing points so that I know where the actual stitching lines begin. Thank you for your response. Gosh, how does a perfectionist like myself even begin eye-balling stuff. But if the sewing points are marked, I guess you don't pay that much attention to lining up the edges of different pieces, but rather, I assume, pin together at the stitching line. Or no? I am just about ready to jump head first into drafting, adding no SA to my patterns and cutting by estimating. So much change at once! Josie - I don't line up the edges of my fabric, either. I usually baste or (if I'm in a hurry and don't care much for precision or if the lines are straight rather than curved) the stitching lines together, yes. The actual SA mean nothing to me. I hadn't realized, until I came to the US, how religiously people here follow SA and "lines them up" and needed them included in all their patterns. We never paid much attention to SA back in Singapore where I learned to sew. We changed SA whenever it suited us, and only ever paid attention to the stitching lines themselves. I guess we all learn to sew differently, huh? Good luck with your new sewing direction! Thank you LiEr, you and your drafting series has been most helpful. You're right about "religiously lining up edges." That's how I and every single sewer I know (and I know a LOT) has been taught. I didn't know any differently, (and was irritated by patterns without SA) until I read your blog. It sounds so much easier - once I get the hang of it. Thanks again. dose anyone know how to remove straight pin marks from sheer fabric. It is a formal gown that needed to be hemmed. Didn't think about the pin marks before I pinned it up. Help! I don't understand the reason for unpicking a seam. Please explain. The rest was good and I learned a lot from the pinning of pattern points. Absolute genius! Thank you for this tut! I always mark my dart lines, but almost never mark the seam lines. Without the dart lines fully marked, I would sew everyone of them crooked, or just plain at the wrong angle. I even baste my darts first. Recently I made myself an underlined dress, and there I found that not only did I have to mark the dart lines, but thread trace them as well. Otherwise I would never have been able to sew up the darts with two slippery layers of fabric. While I rarely ever mark seam lines, my mind is too thick and slow to note which seam lines are narrower or wider, so I cut them all the same 5/8". That way I don't have to try and remember it all. If ever I make that °Chanel inspired" jacket, with the $200 a yard fabric, you better believe I will be marking AND thread tracing the seam lines as well as any darts (although her jackets were all shaped by seams and ironing, so no darts!) I also feel more confident when sewing welted pockets when I thread trace the seam lines for the welt. Wouldn't want to get that wrong and end up ruining my project just because I was too lazy to take the extra step! I don't sew enough to be able to take a lot of short cuts, and having learned the hard way how much precision matters, I take my time with the tricky bits. Your way works for you, so I don't write to critique it, just to point out to people that there is nothing wrong with marking up your garment pieces if you need the confidence it can give you. I will also add that my way is SLOW, and nothing I make is whipped up fast! Well, except for my T-shirt pattern that I have made often enough that I just automatically know how to cut it and how to sew it up.